Doctor’s CarbRite Diet Extra Rich and Fudgy Brownie Mix with Chocolate Chips, a sugar-free additition to our products. Dixie Diner Texas Toasters New Flavors of “Onion and Dill” and “Pizza” are now available! The NevadaManna (previously called CarbSmart) Chocolate Chips are now back in stock. These sugar free, low carb, no sugar alcohol, chocolate chips are great for baking or snacking. Jelly Belly Sugar Free Sours are now available. Each 3.1 oz. bag contains 70 sour pieces. Each serving is 35 pieces, only 80 calories, and 4g of net carbs. Each bag contains a mix of sour cherry, sour grape, sour green apple, sour lemon, and sour orange jelly bellies. 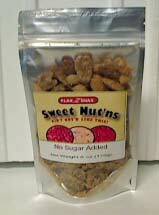 Flax Z Snax Sweet Nut’ns are now back in stock. These make for sweet and salty snack. Flax Z Snax High Protein Low Carb Cookies are now back in stock. 10g of protein and only 1g of net carbs makes for a sweet treat. Each pack comes with 2 cookies. 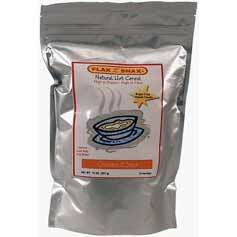 Flax Z Snax Hot Cereal is back in stock in both Cinnamon Nut and Butter Pecan flavor. Low in carbs and perfect for a morning pick me up. 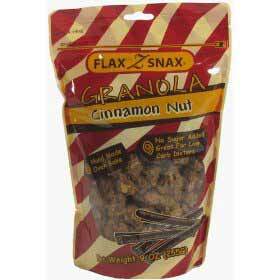 Flax Z Snax Granola is back in stock in all flavors of cinnamon nut, wild cherry, cranberry macadamia, and blueberry nut. If you haven’t tried these low carb granolas before, we highly recommend them. Only 1g of net carbs per serving. Dreamfields low carb pasta is now available in angel hair, linguine, spaghetti, rotini, elbows, and penne rigate flavors. La Tortilla Factory Low Carb Wraps are back in stock in all flavors and sizes. The small wraps are only 3g of net carbs and zero diet count each. All the flavors including Whole Wheat are packed with flavor and are thick enough tht they won’t crack or break.